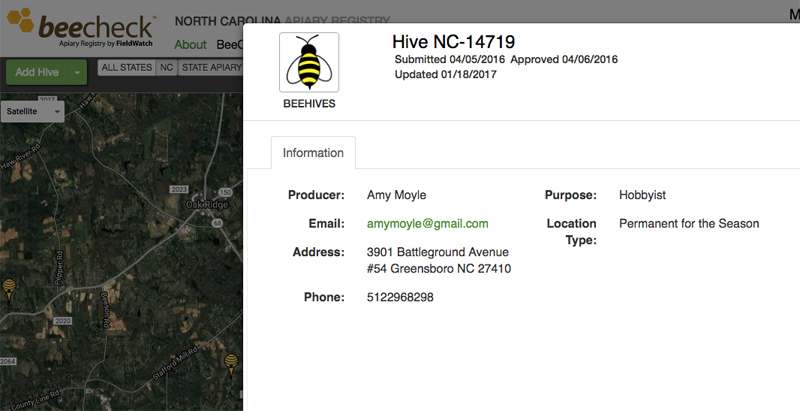 The N.C. Department of Agriculture and Consumer Services has joined other states in partnering with FieldWatch, an online mapping service to help prevent crop damage and bee deaths due to accidental/unintended pesticide drift. FieldWatch is currently operating in fourteen states and one Canadian province: Colorado, Delaware, Illinois, Indiana, Iowa, Kansas, Michigan, Minnesota, Missouri, Montana, Nebraska, New Mexico, North Carolina, Wisconsin and the Canadian province of Saskatchewan. This program is voluntary, non-regulatory and free to use for beekeepers in the states listed above. The program aims to improve communication between farmers and pesticide users. Once you have registered your hives, the information will be verified and you will get notified that you are fully registered. 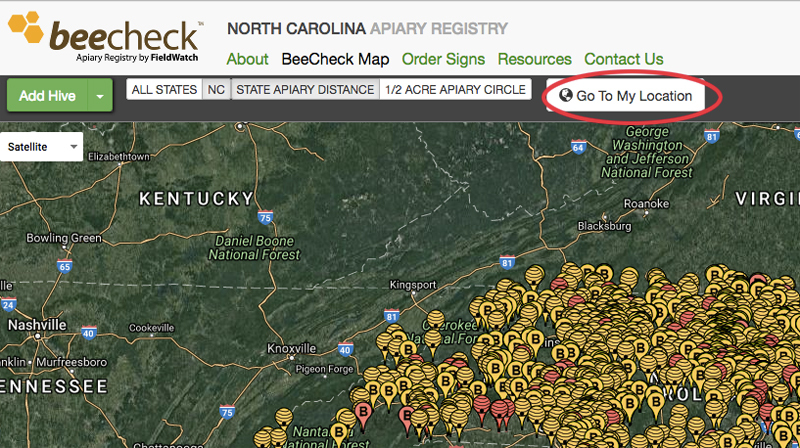 When you get to the NC map, you will see all of the bee hives registered in the state. To see hives in your area, click on the “Go To My Location” button. You’ll see all of the apiaries in your area. If you zoom in on any of the apiaries, you will see more detail. 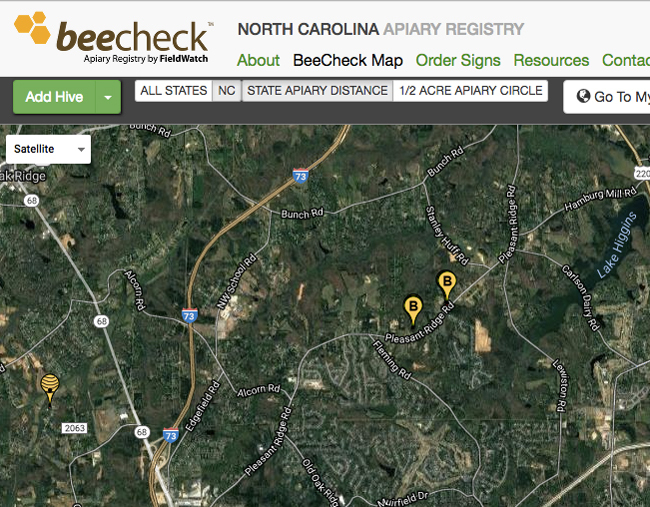 Here’s what Lazy Creek Apiary @ Gate City Harvest farm looks like on BeeCheck. 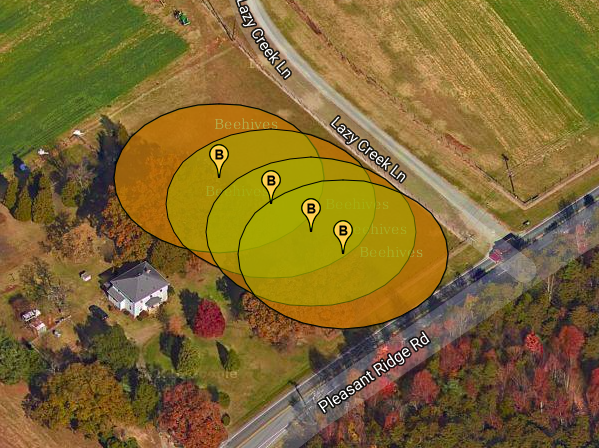 I have 4 hive stands, so there are 4 locations marked. If you click on any of the flags, you will see the contact information for that beekeeper.